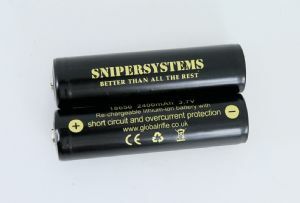 You are purchasing two Top Quality Global Rifle Snipersystems 18650 Protected Lithium-Ion 3.7 volt re-chargeable Batteries. Genuinely 2400mAh. Long life. Snipersystems - better than all the rest! These come in the recommended packaging for safe transit. If you have purchased the best kit, always use compatible top quality batteries. When researching l-ion batteries for Snipersystems products, we tried numerous lithium-ion batteries from countless suppliers and most were really rubbish!! They lasted for an hour, whereas ours lasted 5 hours under test conditions. We supply the best, and we supply these batteries with our kits. They will not damage your light and will give a steady and constant source of power. They can be re-charged almost endlessly provided you use a "Smart" charger which will switch itself off when charging is complete. Ours are 2400mAh 3.7v. Please do not try to use others which are labelled differently, or use any other manufacturer's charger for them. Others may also not have as good a life span as Snipersystems. Lithium-ion batteries do not have a memory, so are best charged up each time you use the light. Note You are purchasing two batteries.